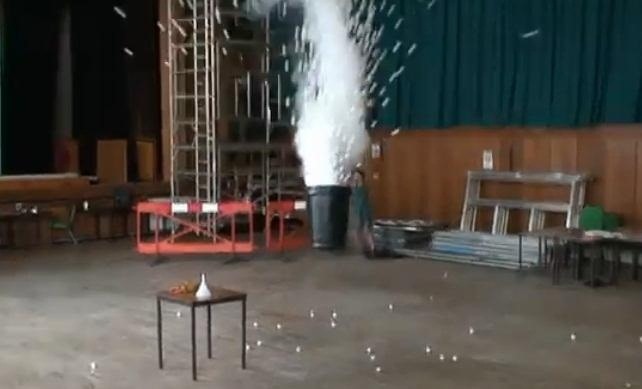 Some lucky students in Dr. Roy Lowry's class at Plymouth University got to see one of the coolest class experiments ever when he turned a trash can into a liquid nitrogen bomb. He started by pouring a few gallons of warm water into the trash can, then filling about 1/3 of a 2-liter bottle with liquid nitrogen. After screwing the cap on tightly, he lowered the bottle into the trash can, then poured two trash bags full of ping pong balls on top. Then, all that was left to do was...run. The nitrogen changes from a liquid to a gas when the bottle is sealed, which causes it to expand and create pressure. Once the pressure builds up enough, the bottle explodes and sends the trash can and ping pong balls several feet into the air. I'd hate to be the one cleaning this up! This liquid nitrogen bomb isn't new. In fact, we've seen it a few times before, but it never gets old. Don't have enough space for an explosion this size? You can do the same thing on a much smaller scale with film canisters.